What do rising and falling wedges look like? How to trade rising and falling wedges? When should you enter the market? Rising and falling wedges are a technical chart pattern used to predict trend continuations and trend reversals. In many cases, when the market is trending, a wedge will develop on the chart. This wedge could be either rising or falling. Wedges can also appear at the end of a bullish or bearish trend. Thus, a wedge on the chart could have continuation or reversal characteristics depending on the trend direction and wedge type. Although many newbie traders confuse wedges with triangles, rising and falling wedges are easily distinguishable from other chart patterns. 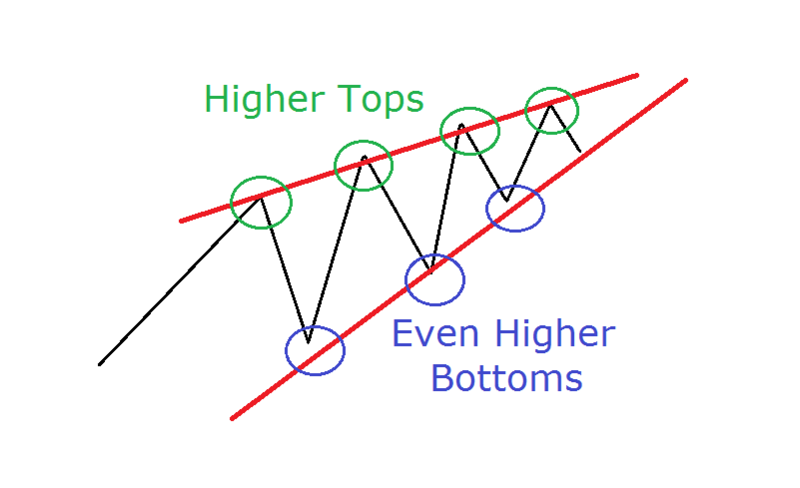 The rising wedge chart pattern develops when price records higher tops and even higher bottoms. Therefore, the wedge is like an ascending corridor, where the walls are narrowing until the lines finally connect at an apex. Note that the rising wedge formation only signifies the potential for a bearish move. Depending on the previous market direction, this bearish movement could be either a trend continuation or a reversal. In other words, during a rising wedge, price is likely to break through the figure’s lower level. As you see, the bottoms are decreasing, but the tops are decreasing at a faster pace. Opposite to rising wedges, falling wedges provide a bullish signal, which implies the price is likely to break through the upper line of the formation. The answer to this question lies within the events leading up to the formation of the wedge. During a trend continuation, the wedge plays the role of a correction pattern on the chart. For example, imagine you have a bullish trend and suddenly a falling wedge develops on the chart. In this case the wedge represents a correction. Thus, we expect a price breakout from the wedge to the upside. The same applies for rising wedges. The difference is that rising wedges should appear in the context of a bearish trend in order to signal a trend continuation. Ultimately, the price action will break to the downside. This is the 10-minute chart of General Motors from the period Aug 29 – Oct 1, 2015. As you can see, GM is in a strong uptrend, which is tested a total of 9-times. There are two falling and two rising wedges on the chart. As previously stated, during an uptrend, falling wedges can indicate a potential increase, while rising wedges can signal a potential decrease. Notice that the two falling wedges on the image develop after a price increase and they play the role of trend correction. Conversely, the two rising wedges develop after a price increase as well, so they represent the exhaustion of the previous bullish move. As you see, after the two increases, the tops of the two rising wedges look like a trend slowdown. During a downtrend, we have the exact same scenario – price is likely to increase after a falling wedge and price is likely to decrease after a rising wedge. However, since the equity is moving downwards, our rising wedge implies trend continuation and the falling wedge - trend reversal. This is when the two types of wedges switch their roles. Yet, their behavior and potential remains the same. In different cases, wedges play the role of a trend reversal pattern. In order to identify a trend reversal, you will want to look for trends that are experiencing a slowdown in the primary trend. This slowdown can often terminate with the development of a wedge pattern. Above is daily chart of Google and a 10-minute chart of Facebook showing the exact trigger for entering a position. Note in these cases, the falling and the rising wedges have a reversal characteristic. This is because in both cases the formations are in the direction of the trend, representing moves on their last leg. Every wedge has a signal line. Depending on the wedge type, the signal line is either the upper or the lower line of the pattern. For example, if you have a rising wedge, the signal line is the lower level, which connects the bottoms of the wedge. If you have a falling wedge, the signal line is the upper level, which connects the formation’s tops. When you see a break in the signal line, you should enter the market in the direction of the break. For example, when you have a rising wedge, the signal line is the lower level of the figure. When you see the price of the equity breaking the wedge’s lower level, you should go short. At the same time, when you get a falling wedge, you should enter the market whenever the price breaks the upper level of the formation. When trading a wedge, stop loss orders should be placed right above a rising wedge, or below a falling wedge. You do not want to make your stops too tightly as the price action will often violate one of the trend lines before rebounding swiftly. You will want to see a real break of significance to know you need to exit your position. The potential price target of a wedge is equal to its size. This means that if we have a rising wedge, we expect the market to drop an amount equal to the formation’s size. If we have a falling wedge, the equity is expected to increase with the size of the formation. This is the 5-minute chart of JP Morgan from Sep 29-30, 2015. There are two wedges on the chart - red rising wedge and blue falling wedge. We enter these wedges with a short and a long position respectively. The blue arrows next to the wedges show the size of each edge and the potential of each position. The green areas on the chart show the move we catch with our positions. The red areas show the amount we are willing to cover with our stop loss order. In both cases, we enter the market after the wedges break through their respective trend lines. These two positions have generated a total profit of 80 cents per share by JPM. Wedges are technical analysis chart patterns. Wedges could be rising and falling. Rising wedges imply a decrease. Falling wedges imply an increase. Wedges could be trend confirming or trend reversing depending on the previous price movement. We should enter the market with the break through the signal line of the wedge. 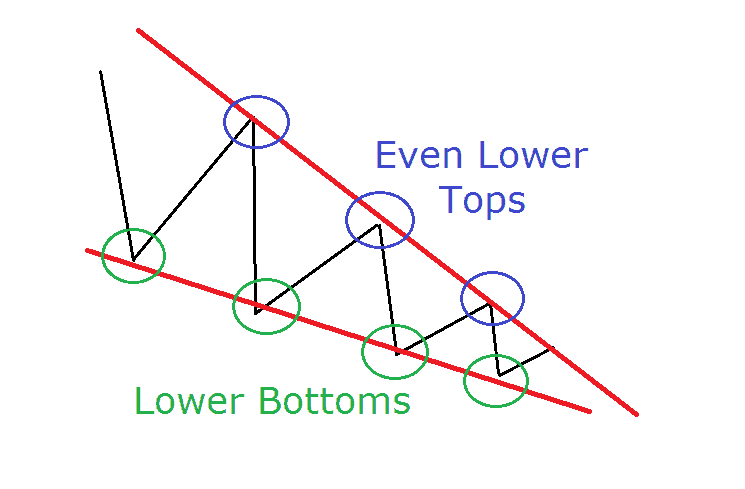 Stop loss orders should be placed above the rising and below the falling wedges. We should aim for a minimum amount equal to the size of the wedge. Even if the wedge is successfully completed, we should not close our position if the equity is still trending in our favor.